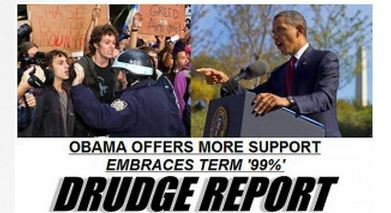 News Hour just reported almost 1000 demonstration cities worldwide claiming solidarity with OWS in the US. 100 cities in the US yesterday all on their own. I think we are seeing in OWS the Tea Party on a really big scale. Tea Party was driven by Fox. This thing is truly grassroots, not astroturf. The 1% frame against the 99% frame is a powerful frame; asking a million questions is just a way to pray to god that nothing gets done. Answers would require the protesters would have to know something about history, current events and have a little old fashioned horse sense..
Protest works with a small unifying question. “We are the 99%” is a question in the form of a statement. Very powerful. The question they are asking is why the disparity in wealth? Actually this question is being asked worldwide from Egypt to Israel to Europe and the US. The protests are very focused and 100% American. You sound more like you’re praying no one starts answering the questions. Not sure about your FOX assumption, I don’t think I’ve watched it a dozen times in the last two years. I started becoming TEA Party in 1970 when I helped one of LBJ’s Equal Opportunity, Project 100,000 victims. I was a registered Independent long before it was fashionable. Last I checked they also were not made up of anarchists, communists and nazis, just ordinary Americans wondering how the 1% came to own close to 45% of all the wealth in the US. Calling them anarchists, communists, nazis, socialist, dirty and uninformed completely misses what is going on which is questioning government, politics and economics pretty much the same as the Tea Party. LBJ’s one of my idols. Totally imperfect man and politician who got much more done than Kennedy could even imagine. Vietnam tripped him up. With watchful eyes the National Psychiatry Industry holds its hands–what is the next move of those whom cannot speak freely. We now have a massive psychoneurosis haunting America! WHY ARE THESE QUESTIONS NEARLY NONSENSICAL, POORLY WORDED, AND IN ALL CAPS. Because they need to get you attention and they appear nonsensical only to those still asleep. Bhaaaaa. What this country needs is to protect the people’s hard earned wealth in creating ways to find employment for hundreds, of whom are generally unemployed, and on low-level qualifications. We are creating a class of parasites, that are milking the working people out of their productive earnings, through developing a parasitic clime of artificial but unproductive elements, that depend on some federal handout called federal emergency programs, geared to leveling capitalism’s optimistic future, and influenced by encroaching socialism, as a forerunner of Marxian fundamentalism, in supporting incipient Bolshevism. It is inconceiveable that a hand full of terrorist have crippled our national commercial flight industry through the commie controlled news industry, with their daily inflated minor news issues, being bloated to the point that the general public runs to and fro courting imaginary fear that our airlines will be eventually shut down. This is a scheme for doubting Thomas’s. America needs to tell Uncle Sam to get of it’s haunches, and get rid of all parasitic bums and leaches, and let these dead beats find more productive work. It seems that nationwide law enforcement has taken preference over a people’s ability to think straight. Law enforcement has been turned into social engineering, collectively, as an unproductive force that protect the great slum masters, and loan sharks, and political hounds, of whom steal from every strong box in the nation’s capital. This country is going under from a form of liberalism that plays along with aimless parasitic laboring organizations, that will aid in creating parasitic industries that are nothing but well organized drones on the backs of hard working and decent tax paying citizens. industry by the artificial increments of ridiculous legal obstructions, being subtly used to further an approaching socialists programming of digging the brains out of the public’s twisted intellect, that Uncle Sam will not let the people down. We should level down national security in giving each state the right to guard the people’s security, to the proper level of individual responsibility. The present encroaching police state under the cover of Home Land Security is nothing less than a pro-Marxist scheme to further incipient Bolshevism, in causing the state to wither away, in replacing capitalism with the ever creeping of Oriental religious philosophies into the American republic.